This is a store owned by K-VA-T food stores that are mainly supermarkets retailing general weekly supplies. 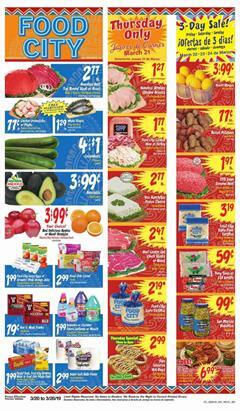 Use the Food City Ad to discover deals like multiple-buy savings, BOGOs, and weekly discounts. Pharmacy is also a part of the Food City stores. Customers can also reduce the costs with digital coupons at Food City. Some coupons have limits up to 5 times. Some can only be used 2 times. 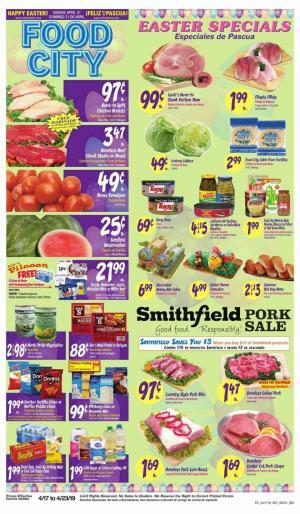 Mix and match deals are also popular savings with the Food City Weekly Ad. Buy snacks, grocery, fresh food, seafood, meat, snacks, pantry food, household supplies, and more with the circular sale discounts. Food City operates with 123 stores in Kentucky, Georgia, Virginia, and Tennessee. The also offers ways to save money. Promotions, weekly ads, digital coupons are a few of them. You can also have valucard to collect rewards for your purchases. Savings club like Wellness, Baby, Kids, Pet, can get you extra discounts. Learn about these clubs on the official page of Food City. Fresh fruits, meat, seafood are three very important categories of the latest Food City Ad. Buy chicken breast, cooked ham, Freshco cheese, corn tortillas, and more today for the best prices. Boneless beef top round steak is only $2.57/lb at Food City stores. 3-pages only ad is sufficient to show the top prices. Soda packs, Coke, Sprite, smartwater, and more soft beverage deals are available in this particular weekly ad. This is one of the simplest stores with an online deal that can be really useful. This small product range can make everyone be able to shop the best offers for a weekly need range. Don't forget to see the ad, check out other weekly ads as well. Boneless Beef Top Round Steak or Roast $2.57/lb. Beef Center Cut Chuck Steaks or Roast $1.97 lb. Subscribe to the Food City Ad to get emails about similar deals and get future ads. Alternatively, follow our Facebook page where we share similar posts. You can always visit this page to get the new sale by the retailer.